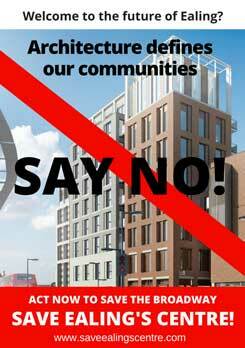 The proposed scheme for 9-42 The Broadway W5 – one of the biggest in recent years for central Ealing — was passed by the Planning Committee on 24 February by eight votes to five but this is not the end of the planning process. Although it has now also been approved by the Mayor of London it is still possible that it could be “called in” by the Secretary of State for determination. The scheme has been condemned by Historic England (formerly English Heritage), the Victorian Society and SAVE Britain’s Heritage. The proposal would result in the loss of most of the Victorian and Edwardian frontages that face Ealing Broadway Shopping Centre. The outcome is very disappointing particularly given the universal condemnation of the proposals by national and heritage bodies. If sufficient people lobby the Secretary of State and convince him that the application raises national issues of importance in relation to preserving our heritage then it is possible that the proposals would be subject to a public inquiry along the lines of the one that took place in 2009 and overturned the Council’s approval for the earlier Glenkerrin scheme for the site. Save Ealing’s Centre (SEC), with which the Society is associated, has written to the Secretary of State seeking call-in and residents who are concerned about the impact of the development on the town centre should write to support the application for call-in. You can download SEC’s letter here. See the SEC website for further information.